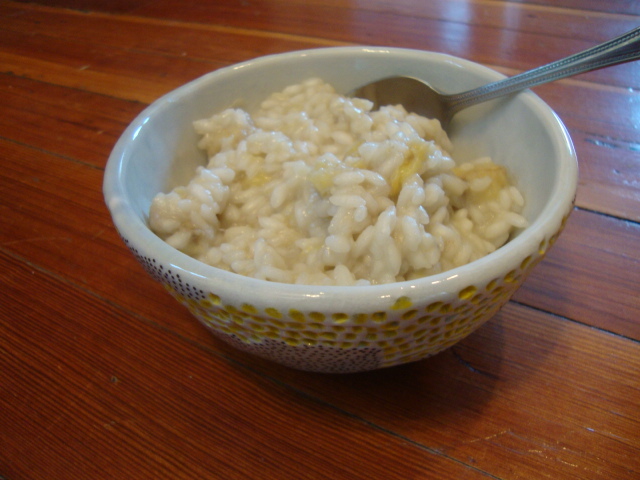 This banana risotto is perfect for breakfast; it’s chewy and nutty with just a hint of sweetness. This recipe makes two large servings, but can easily be multiplied for a crowd. For any size batch use the proportions: 1 rice – to 1 coconut milk – to 2 water. In a small saucepan, combine coconut milk and water and heat to boiling. Reduce heat to low and cover the pan. Melt butter substitute in a large pan over medium heat. Add bananas and saute until they turn a deepened yellow color. Season with salt. Add rice to the pan and toast, 1 minute. Add approximately 1/2 cup of the liquid mixture to your pan. The liquid needs to be at a low simmer, so lower or raise your heat accordingly. Stirring constantly, cook until all of the liquid is absorbed. Working in 1/3 cup increments and continuing to stir, add the rest of your liquid to the pan until it has all been absorbed.